Not since the Oil Derrick in 2007 has a single piece of art on the Playa attracted so much attention. 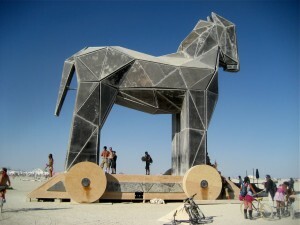 The Trojan Horse stood 50 foot high. It weighed 28 tons. Each wheel weighed 2600lbs. It was open for rear entry at night, where those (un? )lucky enough to climb inside its backside were rewarded with absinthe. And the night it burned – because, of course, you only construct something this magnificent with the intention that it will be destroyed at the end of the week – several hundred volunteer “slaves” carried it into the desert, from where it was attacked by an opposing army firing genuinely flaming arrows, and once the body caught fire and burned through, the fireworks that had been stored inside exploded with all intended magnificence of display. It was the best burn at Burning Man since the Oil Derrick. So I am told. Because, remember, this year’s theme was “Rites of Passage.” And my son Campbell and I and I went through a major one. At almost 16, it wasn’t like he was really a kid any more – he flatly refused to wear the camp wristband that effectively says “if I am lost, take me back to Kidsville” – but he’s certainly not an adult either. So when we set out to the Playa on Friday, the night of the Trojan Horse burn, I reminded him, as I usually do, that if we got separated, we should meet back at camp; at least I knew that, perhaps unlike previous years, he’d be able to find his way there. So when we did get separated, for the very first time in four burns, in confusion over which Mutant Vehicle to ride to the Horse after the wonderful fireworks display hosted by the Flying Lotus Girls, I took it in some sort of stride. It was bound to happen eventually, I figured, and better it be this year than in the past, when I’d have felt genuinely fearful and probably panic-stricken. (Even two years ago, the last time we were attended, he was only 13, and losing him in the midst of the PLaya at night would have been bad news indeed.) And so I returned to our camp at Kidsville, laid down in the tent and awaited his return. Three hours later, I was woken up by an excited teenager. “Dad, wasn’t the Trojan Horse burn spectacular? I got right up close to it. Where did you watch it from? Dad, why are your el wires still glowing? Dad, have you been sleeping? Dad, did you miss it?” Evidently, I did. And evidently, he didn’t miss me one bit. Had this happened somewhere else – i.e., not at Burning Man – I’d have been furious that he hadn’t come back to find me, probably blamed him for the fact we’d lost each other to begin with, and there’d have been recriminations galore. Lying in the tent at 2am, listening to his excited rant about the Trojan Horse burn, it struck me that this needed to happen, that in fact it was long overdue, and that if I had missed out on something I’d very much wanted to see, then I would have missed out on so very much more if I had never made that last minute decision to bring him with me to Burning Man in the first place, four full years ago. And anyway, there’s always YouTube.